A collaboration of creative minds made this Guatemalan inspired project a piece of art, a combination of traditions and culture with a contemporary twist makes this project a creative identity space, with a lot of evolution on Guatemalan essence. El Mercadito de La Esquina is a cultural Project located in Guatemala City, inside the district called 4º Grados Norte. 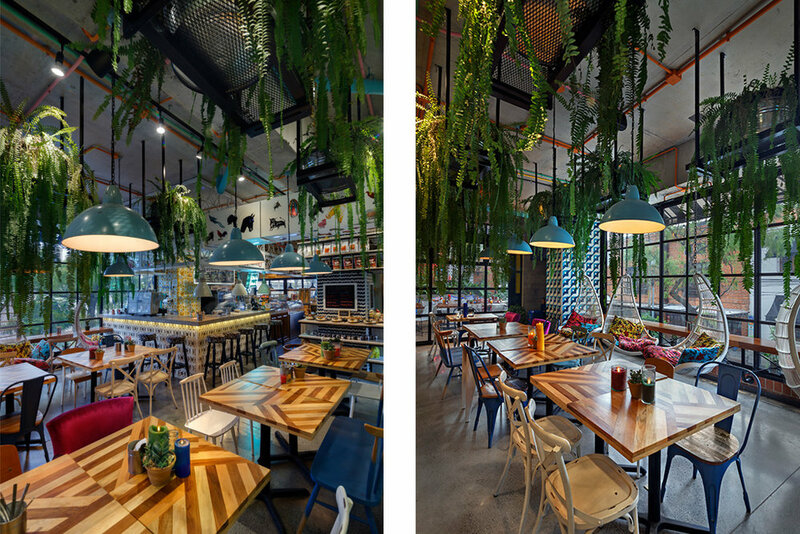 The design of this space is the result of the fusion of several creative minds that sought to reflect the modern re interpretation of Guatemalan culture. Inside this market there are several gastronomic stations with regional food adapted to a gourmet style. Included stations: La Figura, which seeks to take care of your health through light, low fat meals. Cafecito Xelaju includes desserts and sweet treats along with coffee, tea and milkshakes. 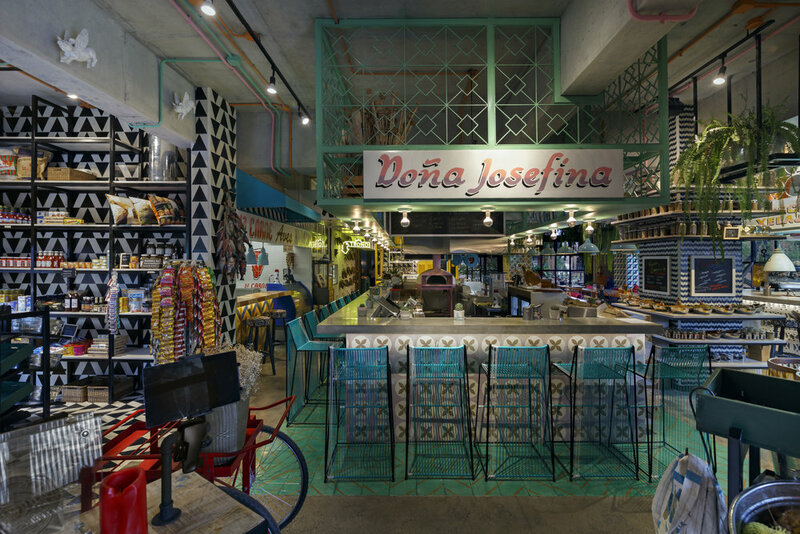 Doña Josefina brings the bakery flavor with dishes such as pizza baked in a wood oven and pastas. The Meat, Poultry and Seafood station adds a variation of main courses to the menu. And last but not least, in the outside deck we find the taco station, Guatemalan beverages and vegetarian options. In the interior of La Esquina you can find an exclusive store that sells handmade, organic and products without preservatives. This place helps out and strengthens the local economy by working hand in hand with Guatemalan small businesses such as farmers, tea growers and others. The goal is to elevate the public opinion and perception of the quality local products have. 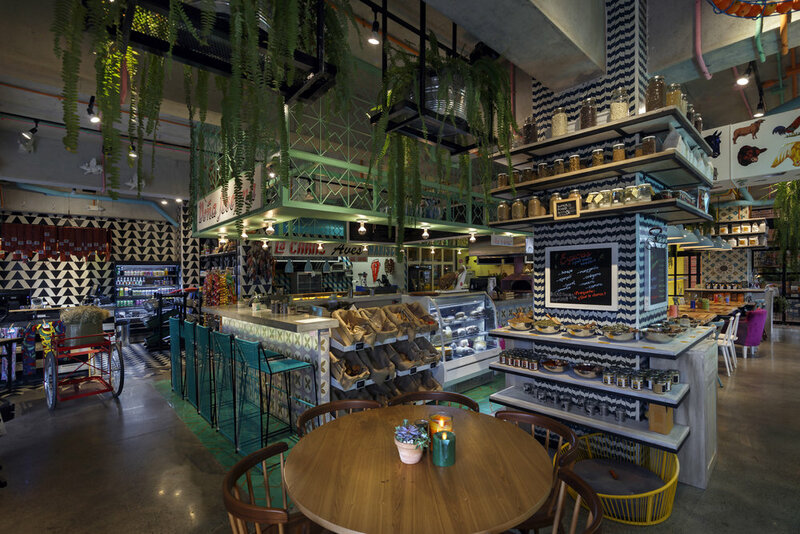 Its interior design reflects the concept of appreciating Guatemalan culture, due to this, details such as hand painted tiles, local wood, regional embroidered upholstery, and furniture assembled by local artisans were included in this beautiful location. The graphic design covered not only the usual target areas, it also embraced luminous details, identifications signs and vents. All under the concept of enriching and sharing Guatemalan culture. La Esquina market as innovated the experience of living Guatemalan culture, for it seeks to bring back to life a forgotten neighborhood and the Guatemalan identity. It is an open space for all ages and personalities that adapts itself to the demands of a high taste. Inspired in the Guatemalan markets it has evolved and makes known the unique flavors that are enjoyed in Guatemala through the local gastronomy.